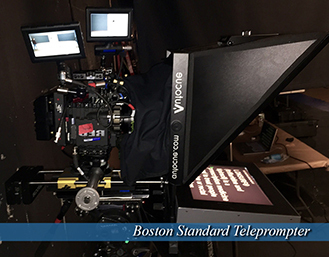 We have the following teleprompter gear and are ready to go! The equipment is delivered by an experienced, professional operator.For further details and price information about all rental options, click any tab below. Price: $250/Day; $750/3 Day WeekIt is only available for in-office pickup or shipping. 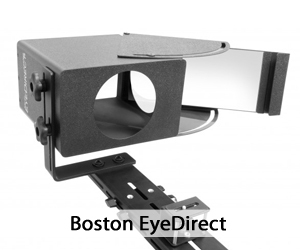 The EyeDirect functions like the standard Mark III Interrotron in that both talent and director are able to see each other “face to face”. The unit utilizes a mirror system to achieve these results, and does not require any battery or AC power. 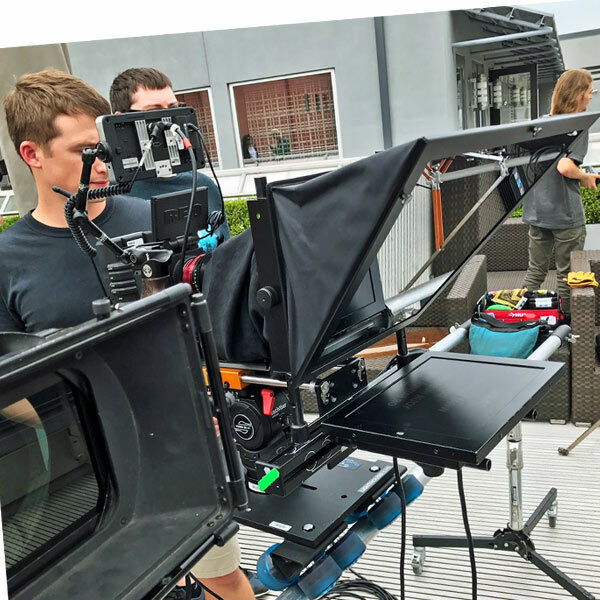 The unit also comes with an iPad mount, which can be used to turn the device into an iPad teleprompter.The unit comes in a custom-fitted Pelican case which protects it while being shipped. The case weighs 30 lbs and is just a bit larger than the typical airline carry-on bag. Price: $945/10 Hour DayThe Presidential Teleprompter allows the speaker to address the audience without being blocked from view. Two glass panels are set up on steel rods. Monitors are placed at the bottom of the stands, which displays text and projects them onto the glass for the speaker to view. While he/she can see the text, the audience does not. Instead, they see right through the glass and get a clear view of the speaker. 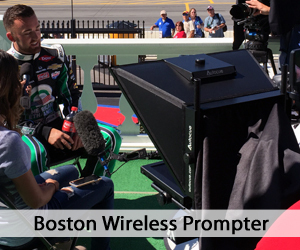 For this reason, the device is sometimes called the “invisible teleprompter”.Since Presidential Teleprompters are mostly used for live events, our operator always brings a backup laptop with prompter software. It is also wise to request that the operator arrive a few hours before show time so that he/she can work with the talent and set up the prompter, and fonts, in a way that is most comfortable for the speaker.For more information as well as images of the Presidential Prompter click on the tab at the menu above.Presidential Prompter aka Speech Prompter Click HereA-List Talent We Have Prompted For. Click Here. Price: $745/10 Hour Day (with operator) for 2x 19” monitors or 1x 32”/36” monitor on a black stand. For larger monitors and unique setups, please call Bill at 917.414.5489. Although it’s common for most speakers to stand behind the podium, some people (performers and singers) prefer to walk around the stage. In cases like this, the Confidence Monitor is the appropriate teleprompter. These are small, flat screen HD monitors which can receive any signal from a teleprompter. 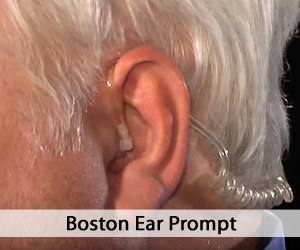 They can be placed downstage, offstage or in the back of the room behind the audience. 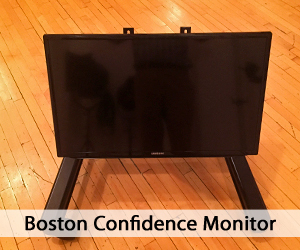 Check out the Confidence Monitor page for more information as well as images of the units by clicking on the link in the top menu. 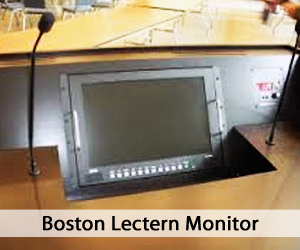 Price: $745/10 Hour Day (with operator)The lectern monitor is another alternative for the presidential setup. It is a thin monitor placed on top of the podium out of sight of the audience. The cable is run down the inside of the podium and out to the operator (seated off stage). The speaker just glances down at the top of the podium as if he/she were simply looking at notes and then gazes at the audience in a natural way. This unit is not available at all locations and is custom-built.Please call Bill at 917-414-5489 or Jocelyn at 646-617-6535 for more information re availability and pricing. A sprawling metropolis that covers 48 square miles, Boston is the largest city in New England. Rich in history and home to a robust arts scene, Boston is a popular tourist destination. The city is also the film hub of New England. 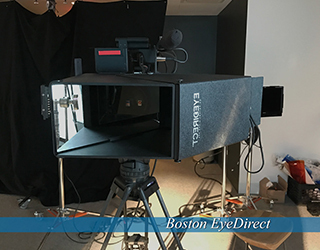 A participant in Massachusetts’ tax incentives, Boston offers a 25% production credit, tax exemption for production, and a 25% payroll credit for productions with a budget over $50,000. 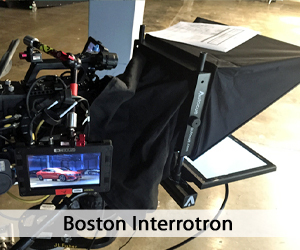 We proudly serve the entire Boston metropolitan area and Eastern Mass with a full array of prompters. 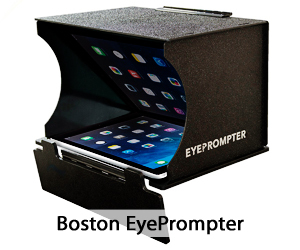 Often on demand are standard Teleprompters, Interrotrons, Confidence Monitors aka “Down Stage” or “Rock ‘n Roll Monitors” as well as EyeDirects, EyePrompts aka iPad prompters. 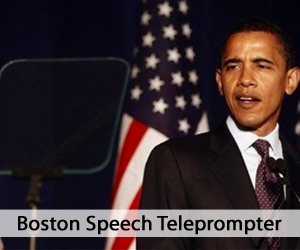 Speaking in front of an audience and using a teleprompter is not an easy thing to do for those with no experience. When you must give a great speech, it may make sense to hire one of our experienced speech coaches. They will bring either a standard prompter or a presidential unit and work with you to make the best possible presentation.Some of our coaches are actors or acting teachers. Lynn has had some success in the acting arena. Let her show you the way to a confident, relaxed and ultimately a convincing and effective speech. Larry Thomas is a producer and office manager for AMC’s Boston location. The class clown growing up, Larry enjoys comedy and is a great fan of the Coen Brothers. His favorite film is Fargo. 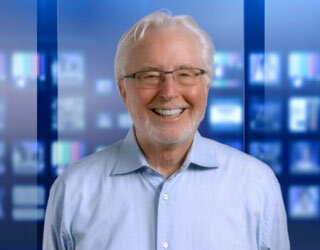 Larry has a background in live event production and even took up DJing along the way. AMC was excited to welcome such a multitalented man to the family earlier this year. Larry helped make us Number 1 in Boston. 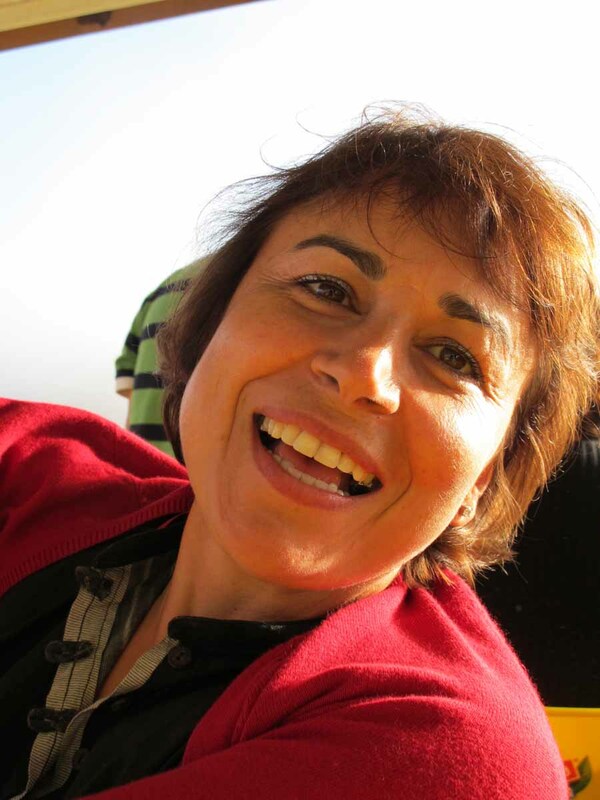 Meet Carol PierceCarol Pierce joined American Movie Company as a teleprompter operator in 2010. When she’s not on set, Carol can be found in a cafe writing her feature length screenplay and window shopping at the local mall. She also loves learning, and often takes classes in cooking and painting. She is also the owner of the office dog, Lola. Lola loves going to the pet shop for new toys and is always snuggling with the Boston office staff members. Living in Boston, Massachusetts has been incredible. It has formed some of the best memories of my life. I am aware that I am lucky in that I can say what most can’t. I spent several summers eating hotdogs and drinking fresh squeezed lemonade at Fenway Park with my father. He was an untiring jogger and eventually, I became one as well. I was very active and followed my father’s footsteps, as it were. My favorite place to jog was and continues to be along the Freedom Trail. It’s a 2.5 mile magical run. Canopies of bright, colorful leaves, engulf and protect you. The ground molds to your shoes making the impression that you are floating. The fresh, brisk air kisses your cheek. All this is conducive to a calming experience, one you yearn for daily. As a single mother, I have become part of a strong community of other single parents. We jog together and coordinate lunches or play times for our kids. It’s been a lifesaver for me. Recently I celebrated my 34th birthday and realized that my son, Culley is seven years old now. He’s been my greatest teacher to date. He has sandy, brown hair and a smile that lights you up from the inside out. He is bright, precocious, imaginative and highly inquisitive. He loves to go the movies. Marvel related movies make him the happiest right now. He’s fascinated by how they are made. He’s expressed a desire to be involved in that area when gets older but not as an actor. A few weeks ago, my friend Randy invited us to join him on set to watch the making of a commercial. Culley was so intrigued and asked questions of the crew. They, in turn, enjoyed explaining and showing him their function. Each is a separate part yet all work together, like a well-oiled machine. Given my circumstances, I have always worked to support the two of us. I have had over 14 jobs in every area imaginable. I have modeled, acted, written, taught. I have cleaned houses and waited tables. I have mowed lawns and lived off the kindness of strangers. (As one of my favorite characters would say.) But not until now could I say that I have a job that I actually love and look forward to going to. Randy introduced me to one of the teleprompter operators, Gina, who has a son around Culley’s age. We got to talking and the next thing I know I’m starting a new career! It’s only been a few weeks but I am so happy to be working with what has become a family of sorts. I found such an amazing and talented team at this company. They took the time to train me. Their unlimited patience won’t be forgotten. I appreciate the opportunity. In addition, and perhaps most important, Culley is able to visit the sets and see behind the scenes. It’s as if he’s an intern. This is invaluable experience for him at his age. One of our grips even let him pull the camera attached to a dolly on small tracks. His big brown eyes lit up the size of saucers and sparkled with a happiness that transforms me. Life is finally beginning to feel complete. I often pinch myself, am I living in a movie? BCEC, Boston Convention and Exhibition Center is an incredible structure, a large venue that is valued both as an exhibition center and an entertainment magnet. It holds large-scale events both private and public. Painters and galleries from the US, Europe, and Latin America have shown their artwork here. Many theatrical productions, musicals, concerts, festivals, and yes, conventions and conferences have been held here. We at TeleprompterRental.com and American Movie Company consider ourselves lucky to have worked at these venues. We’ve supplied Teleprompters, Presidential Prompters, Podium Prompters, Confidence Monitors, etc..
Another remarkable space is the Conference Center at Waltham Woods. It is an imposing building situated within the headquarters of the Massachusetts Medical Society. It is part of the technology corridor surrounding Boston proper. This mind-blowing center offers it all – extraordinary facilities for businesses from here and abroad. Corporations hold training sessions and meetings and provide educational courses to an appreciative following. Beautiful surroundings, great food, unequaled services in all areas, lead to great success. If the above resources weren’t enough, there is an amphitheater with stadium accommodating about 200 people. Come! You’ll be happy you did.